MDF and particle board are both examples of engineered wood. Particle board is a composite material that’s made by mixing wood particles with a resin or some other binder. It’s cheaper and has a more uniform appearance than wood and is most often used in applications where cost is more important than appearance and strength. Particle board is one of the weakest types of particle board and should be used in load-bearing applications. Manufacturers frequently glue a wood veneer over particle board to make it resemble wood more closely. Feed the raw wood material for the particle board into a disc chipper. This chipper typically has between four and 16 blades which cut the material into small particles. Dry the wood particles and screen out any particles that are too large or small. Spray the resin onto the particles through nozzles. Urea formaldehyde is the most inexpensive type of resin and is appropriate for many applications that don’t require water resistance. 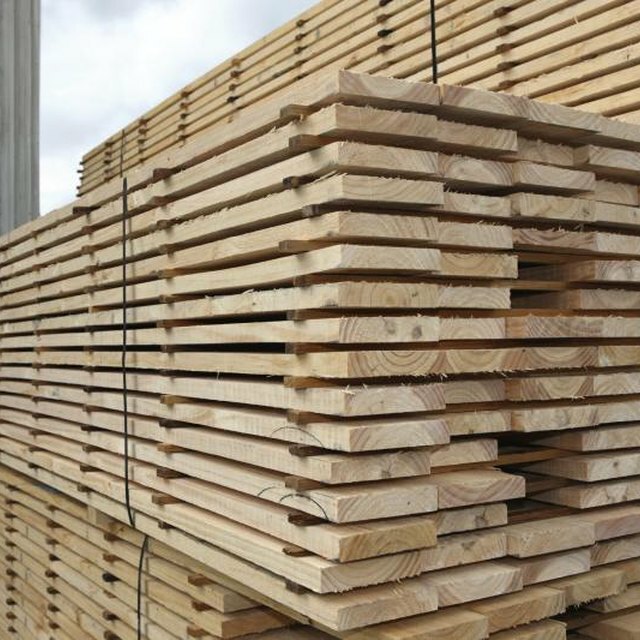 [Melamine formaldehyde](http://sciencing.com/melamine-formaldehyde-6495357.html) is more expensive but provides moisture resistance to the particle board. Mix the resin with the wood particles and pour it into a sheet. Use rotating rakes to distribute the particles in the resin according to size. In the case of particle board with a graded density, an air jet distributes the particles. Cold-compress the sheets to make them thinner and therefore easier to transport. These sheets will later be compressed again to achieve their final thickness. This process requires 20 to 30 atmospheres of pressures and a temperature between 140 degrees Celsius and 220 degrees Celsius. Cool, trim and sand the particle board. It can be sold without treatment or covered with a wood veneer.